Starbucks in the comfort of your own home with a great deal too! Get this discount on the system that will give you the same delicious flavors that you get at your favorite Starbucks location. Who doesn’t want to SAVE $50 on their purchase of this practical machine. Get the Verismo™ 580 Brewer in Silver, Piano Black, Burgundy, Champagne and the Verismo™ V•585 Brewer Piano Black. Save $50 on any of these 5 beauties. Match your decor and save money at the same time. If you’re on the run, off to work, running late or whatever the situation, if you don’t have the time to make that stop at your local Starbucks, here is your answer. 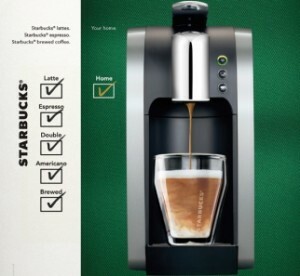 With the one touch of the button, you will have your favorite beverage ready in minutes.